Buy one pair of jeans, get two totally different looks. It's possible with reversible denim from Bleulab. 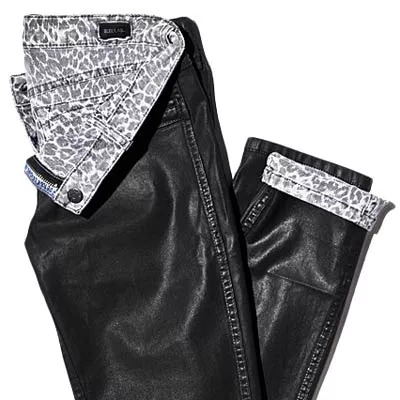 Above is the Cheetah Print/Charcoal Coating Detour Legging ($233; boutiquetoyou.com) with faux leather on one side and a fun animal print on the other. But are these jeans a must-have or a gimmick? Health staffers tried on the trend. Buy one pair of jeans, get two totally different looks. It's possible with reversible denim from Bleulab. To the left is the Cheetah Print/Charcoal Coating Detour Legging ($233; boutiquetoyou.com) with faux leather on one side and a fun animal print on the other. "Not only do they fit like a glove, but both sides are super soft and comfy. Plus, they're lightweight and perfect for travel--two for one." "Cool concept, but the ones I tried were black and gray--too similar. Choose one of the combos that reverses to a wildly different look." "I love how I can switch from a leathery style to cheetah. I actually did this going from work to dinner with friends. So versatile!"